Pop-punk favourites are making a stop in Kuala Lumpur! Tickets on sale now! More details below. 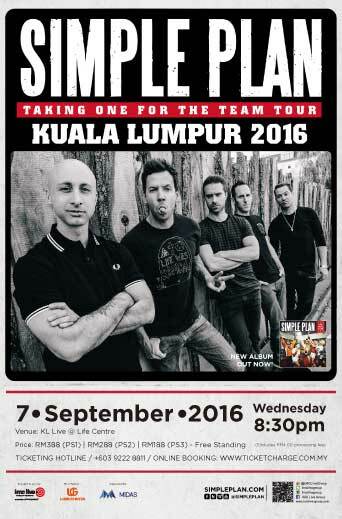 The voice of a generation, Simple Plan is returning to Southeast Asia for their “Taking One for the Team Tour”. This tour comes on the back of their newly released studio album “Taking One for the Team” – the French-Canadian pop punk band’s fifth since their formation in 1999. This tour promises to bring Simple Plan in a big way. Refusing to stagnate and give in to predictability, the band has kicked it up a notch and their passion to make music their fans can relate to is undeniable. Join them in the celebration of their new album this September. Fans will get a chance to rock along to new tracks and sing along to their favourite Simple Plan classics!